Wellness and Fun Fair – 12:30 p.m.
Kettering College and the Physician Assistant Program presented its tenth annual Spring into Health 5K run/walk, benefiting Dayton’s Good Neighbor House (75%) and the College’s Physician Assistant Student Professional Development Fund (25%). 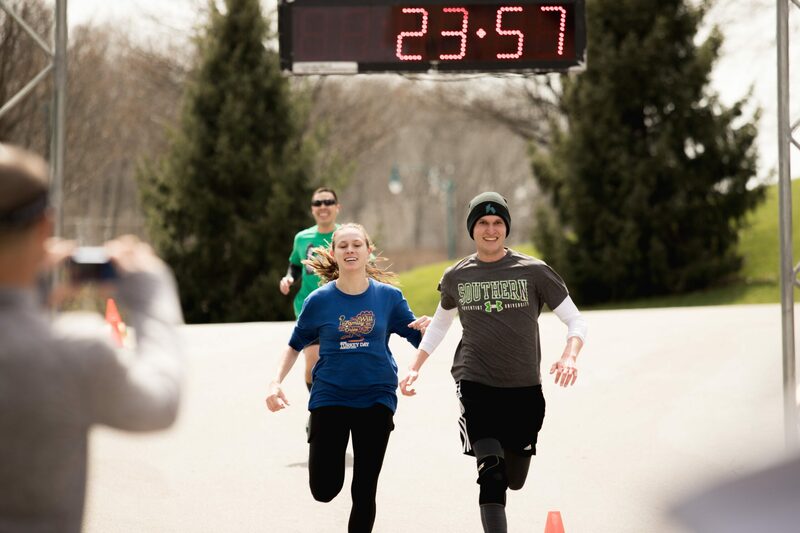 Almost 300 runners and walkers turned up for the tenth annual Spring into Health 5K in April 2018, raising more than $8,000 for Good Neighbor House and the physician assistant department’s student professional development fund. 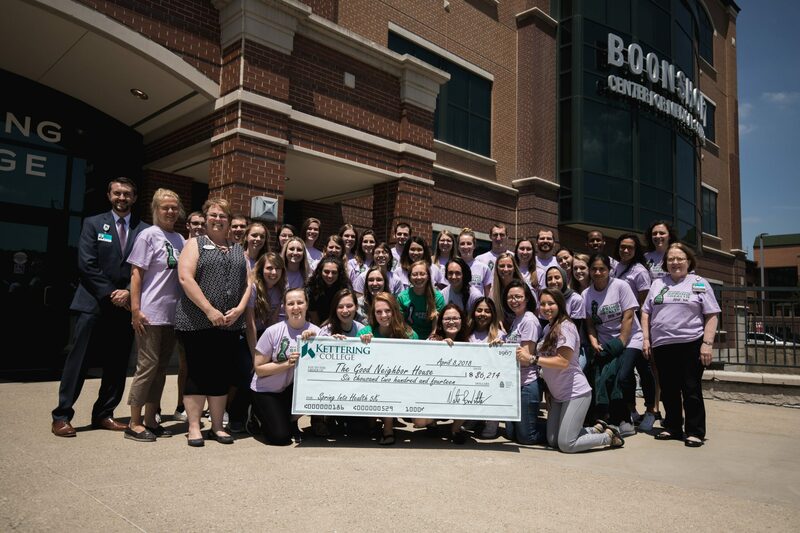 In July 2018, students in the physician assistant department, who have been the primary organizers of the event since its start, awarded Good Neighbor House staff with a donation as a result of this race. Corporate/organization teams (10 or more) should call (937) 395-6611 to register. All paper registration forms must be postmarked by Monday, April, 1. Online registration will close on Monday, April 1. Race weekend entry will be held during packet pickup on April 5-6 and on race day. Note: After March 12, race fees for every group (children, students, and corporate) will increase to $30. During the race weekend fees will increase $40. Packets (including t-shirts for the pre-registrants) will be available for pickup at Up and Running Dayton (6123 Far Hills Ave) on Friday, April 5 from 4-6 p.m., or on Saturday, April 6, from 2-4 p.m.
Race weekend entry registrations will be accepted at this time, for a fee of $40. Extra shirts MAY be available, on a first-come, first-served basis. When you arrive at the college (3737 Southern Blvd. ), please park in the large lot across the street from the school, or around the church. Beginning at 12:30 p.m., packets will be available for pickup. Race weekend entry registrations will be accepted at this time, for a fee of $40, but shirts cannot be guaranteed. You are also invited to join us at 12:30 p.m. for the wellness and fun fair! Kettering Sports Medicine will conduct a pre-race warm-up stretch for all interested racers, so be sure to listen to the PA for announcements about when it is time to gather. Race start time is 2 p.m.The start area will be at Southern Blvd., to accommodate our crowd. The rest of the course remains the same as before. The course map will be provided soon. Make sure one of our volunteers collects your timing chip in the finish chute! Age group and iPad drawing winners will be announced after all racers have finished. You MUST be present to win the iPad mini. *If you choose early packet pickup and for ANY reason are unable to participate on race day, please return your timing chip to the college front desk by 5 p.m. on Monday, April 8. Racers who do not return chips may be subject to a fine. Also, refunds will NOT be given (even for inclement weather). We’re grateful to our partners for helping make this 5K a success! Thank you for everyone who participated in the 2018 Spring Into Health 5k! Good Neighbor House offers a full range of Human and Health Services to the community as we collaborate with many local agencies to assist clients. Through the contributions of dedicated donors and volunteers, the agency is funded and supported by monetary and in-kind donations that help to make a tremendous difference in the lives of many throughout the Greater Dayton Region. 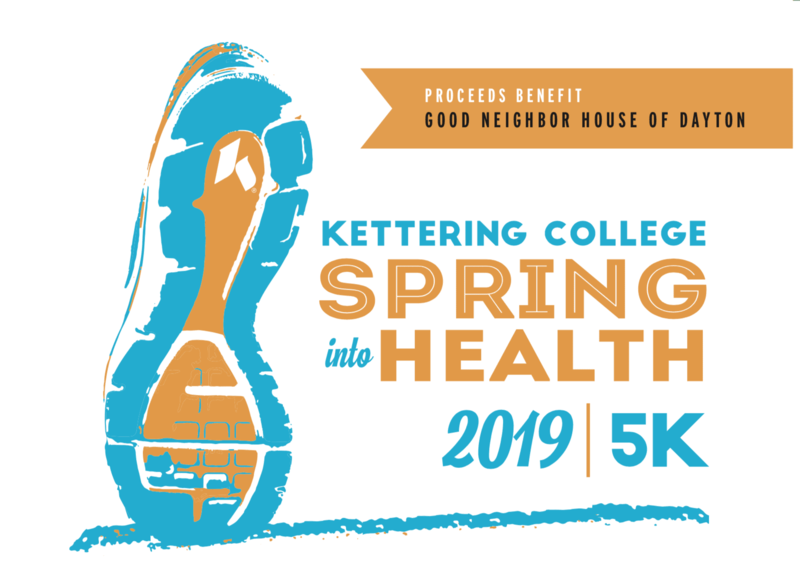 Kettering College is proud to partner with Good Neighbor House each year for the annual Spring Into Health 5k event.